Upate (3:04 pm [Connor]) - We're upping the ante and giving away an additional 2 flags! As part of our Canada Day celebrations, Grey Ops and Crypsis.ca are holding a special giveaway promotion. In the spirit of our national holiday, today we're giving away Canadian flags to 2 4 lucky Canadian readers. BUT these aren't just any run-of-the-mill flags, no Sir. These are Warrior Glo Tape Infrared Reflective flag patches in OD green. These patches, with hook Velcro backing, are Canadian military issue. They're surplus, very rare, and not generally available to the public. But two lucky Canadian readers will be getting their hands on one through us! If you haven't already, become a fan of Grey Ops' Facebook page AND Crypsis' Facebook page. Comment on this post (in the form below) saying, "Grey Ops and Crypsis rock!" The winners will be chosen at random using a random number generator (random.org), and contacted via the email address they used to comment (so use a valid email address that you check often). 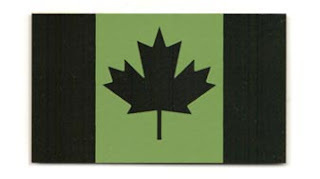 The winners will each receive one (1) Warrior Glo Tape Canadian IR reflective flag patch. Winners will receive their patch via Canada Post. One entry per applicant please. Contest only open to those living in Canada.